One of Progress Energy's solar energy farms in San Antonio, Texas. Progress Energy Carolinas is increasing is solar production. In the last few years the cost of producing solar has dropped by 80%. In addition to cheaper costs, Progress was required to have at least three percent of its retail sales come from renewable energy sources. New state standards will mandate that that figure climb to 12.5% by the year 2021. The solar energy that Progress produces is sold to other companies as a wholesale purchase. As a state North Carolina was 5th in renewable energy production, behind California, Nevada, Arizona and New Jersey. Guilford County is in the running for a massive solar power project. 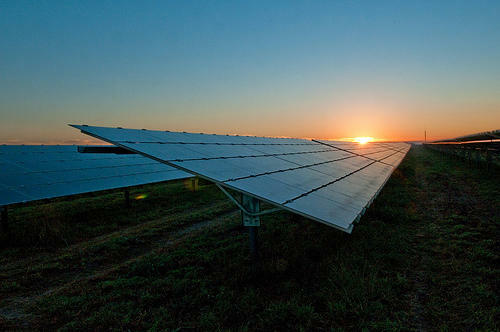 National Solar Power of Melbourne, Florida has selected seven finalists for what it says will be the “world’s largest solar farm” – and Guilford County is on the list. Gail Vadia is a spokeswoman for the Greensboro Partnership – a community and economic development organization in Guilford County. She says National Solar Power has already been in contact with land-owners. Dominion North Carolina Power plans to study the prospect of wind and solar energy on the Outer Banks for small-scale power grids. The utility is launching a three-year research project at its office in Kitty Hawk. The plans include four wind turbines, solar panels and a storage battery that will work to reduce the amount of power the office pulls from the grid. Project manager Sarah Cosby says that network creates a so-called micro-grid that could be useful for small communities during power outages.